This article is a product of The University of New Mexico Prevention Research Center supported by Cooperative Agreement Number U48DP005034 from the Centers for Disease Control and Prevention (CDC). The findings and conclusions in this original article are those of the authors and do not necessarily represent the official position of the CDC. Most of us know the benefits of physical activity. It helps to control weight and reduce the risk for heart disease, stroke, type 2 diabetes, colorectal and breast cancers, and depression. Children need it to build healthy bones and it may improve academic performance. In senior citizens, it reduces the risk of falling and may improve cognitive function. The Community Preventive Services Task Force (CPSTF) recommends “built environment strategies that combine one or more interventions to improve pedestrian or bicycle transportation systems with one or more land use and environmental design interventions to increase physical activity.” Creating more walkable, bikeable communities has all sorts of other benefits too. Getting more people walking and cycling is good for the economy, reduces vehicular emissions, and facilitates social interaction among residents. The only lingering question is how to do it. This past October, residents of Raton, New Mexico met with other stakeholders to conduct a walkability workshop. The group came together to assess pedestrian friendliness in different parts of the city. More important than the actual assessment, it brought people together. Participants came from New Mexico State Parks, New Mexico Department of Health (DOH), City of Raton Public Works and Parks and Recreation Departments, Rotary Club, The Center for Sustainable Community, and University of New Mexico’s Prevention Research Center. A number of unaffiliated citizens attended as well. The twenty-three people in attendance share the City of Raton with about six thousand others. Their community is nestled between the foothills of the Southern Rocky Mountains and the high plains of Eastern New Mexico. 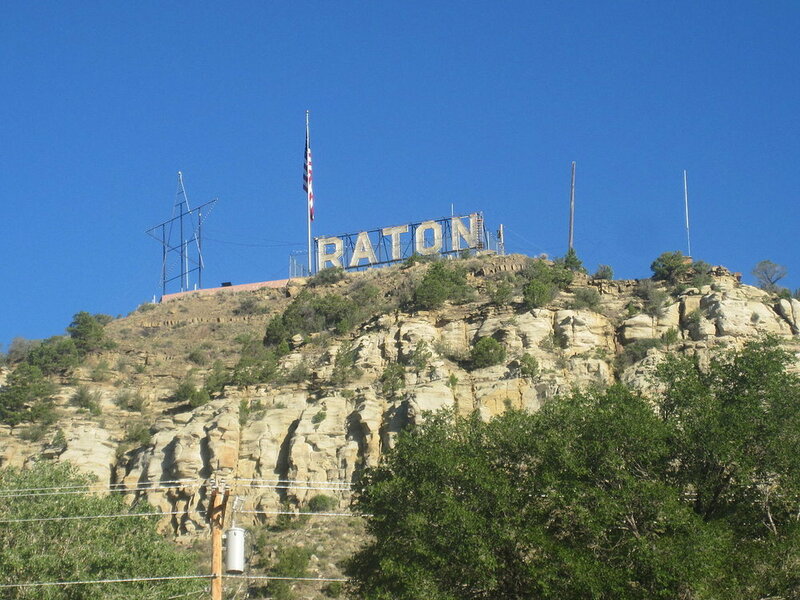 Raton was a mining town and then a horseracing mecca. Today it’s an eclectic mix of small businesses, parks, historic buildings, longtime residents, and recent transplants. It’s a city that isn’t afraid to reinvent itself. It’s also a city that can be challenging for pedestrians. The entrance to one of the tunnels that once allowed pedestrians safe passage beneath the railroad tracks that bisect Raton. The evaluators used whiteboards to identify locations of photos. Photo Credit: Patricia Walsh. “We want to think about people with mobility issues, people with vision issues. We want to make the city more user-friendly,” said Patricia Walsh, a Raton resident and NM State Parks regional interpretive ranger who helped to lead the workshop. Her co-leader was Nichole Romero, a Health Promotions Specialist with the NM Department of Health (DOH). Romero is also a Raton resident. Together, Walsh and Romero lead Ramblin’ Round Raton (RRR), a local walking alliance. With different backgrounds and professional roles, the facilitators were able to tout the benefits of a walkable community to hikers, doctors, retirees, and business owners alike. The workshop participants came together in a cozy meeting room in downtown Raton’s Center for Sustainable Community. The Prevention Research Center provided snacks and water. Following brief introductions, attendees broke into six groups. Each group spent an hour evaluating a pre-determined section of the city. Groups carried an evaluation form, a map of their section, a tape measure for measuring sidewalk widths, a camera, and a photo log. The facilitators developed the evaluation forms from ones used for a similar workshop held in another New Mexico community several years earlier. The evaluation forms used to evaluate neighborhoods adjacent to schools also incorporated recommendations by the Safe Routes to School (SRTS) National Partnership. Two of the groups evaluated neighborhoods around schools. A third group focused on a dog park within a larger city park. A fourth group investigated pedestrians’ options for crossing the railroad tracks that split the town in two. The fifth evaluated a confusing intersection that serves as a gateway to downtown. The sixth group turned their attention to Apache Avenue, a primarily residential street the runs between South 2nd Street, the city’s historic main street, and Climax Canyon, a city park popular with hikers. The groups asked questions about sidewalk width, such as, “is there enough space for two individuals in wheelchairs coming from opposite directions to pass each other?” They noted any utility poles, trash cans, or other obstructions that blocked part of a sidewalk. They looked for landscaped sidewalk buffers. They looked for faded crosswalks, traffic calming devices, speed limit signs, and blind curves. They looked for dogs – stray or fenced – that might intimidate pedestrians. They looked for adequate parking and well-maintained paths in neighborhood parks. They considered safety, access, and desirability. They found positive examples to replicate, and they found areas for improvement. They made copious notes and took plenty of photographs. The evaluation groups reassembled at the Center for Sustainable Community to share their findings. Walsh and Romero had hung a map of the city on the wall. An individual from each evaluation group pressed colored stickers onto the map to identify areas of concern. They then spent a few minutes presenting their findings. The groups made dozens of observations and came up with myriad recommendations. They ranged from seemingly simple solutions such as painting faded crosswalks, to complex infrastructure projects such as building a pedestrian overpass across the railroad tracks. Because so many stakeholders, agency representatives, and local leaders were present, the group was able to decide right away how feasible or difficult most of the recommendations were. After walking around, evaluators identified and presented areas of concern on a large city map. Photo Credit: Ashley Cummings. By the end of the last presentation, Walsh and Romero had identified five recommendations to focus on. The things they chose would be relatively easy to accomplish. The community could use them to build momentum while they puzzled over the bigger issues. One of the ideas they seized on was to improve access to the city’s only dog park. The Rotary Club had recently built the dog park at Raton’s Roundhouse Memorial Park. The dog park is an important resource for local dog owners, but at the time of the walkability assessment, high weeds surrounded it with no clear path from the road. A member of the Rotary Club was there to absorb the critique and discuss the park’s history. He acknowledged the need for better access to the dog park. He also noted that the Rotary Club had been overseeing regular grass cutting there and would look into improving the current conditions. They would also look into paving a path to the parking area in the future. Walsh volunteered to follow up with the Department of Transportation about re-painting particularly important crosswalks near parks or schools. With high vegetation cleared from the dog park, the entrance is easier to get to from the established paths and parking areas. Photo Credit: Nichole Romero. Ramblin’ Round Raton has made solid progress toward its goals since the October 2017 workshop. A representative from the Department of Transportation returned an email saying he would be interested in working with the group on the city’s crosswalks. He was also enthusiastic about assisting with a multi-use trail that community residents have been fantasizing about for years. Community members cleared high vegetation around the dog park, making it easier to access. Planning is not a discipline for people who demand instantaneous results – but things are progressing in Raton. With so many people pulling together, its future promises to be as colorful as the Italianate architecture that lines its historic downtown. Jeff DeBellis is a geographer with the Centers for Disease Control and Prevention’s Prevention Research Center at the University of New Mexico. He works with New Mexico’s rural communities to increase physical activity using evidence-based strategies. Visit www.viva-connects.org for more information.